NASHVILLE, TN — Local and state tourism officials hope to make Nashville a destination for national and international Civil Rights tourism. In January, six Nashville area locations debuted as part of the U.S. Civil Rights Trail, a collection of churches, courthouses, schools, museums and other landmarks, primarily in the Southern states, where activists challenged segregation in the 1950s and 1960s to advance social justice. 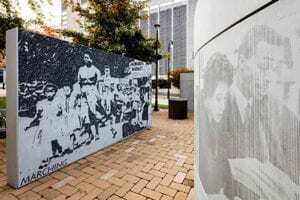 The Trail, which uses the theme “What happened here changed the world,” was designed to connect destinations where important events during the Civil Rights Movement occurred with the goal of attracting both national and international visitors who are interested in historical and Civil Rights tourism. 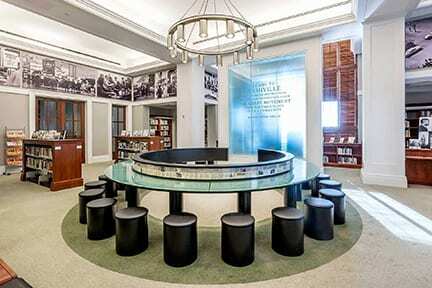 Since its launch 9 months ago, some Nashville sites such as the Civil Rights Room at the Nashville Public Library, are seeing new visitors as a result of the Trail. State tourism officials say they are receiving calls from international travelers requesting brochures and information about visiting the Tennessee sites. To be listed as a location on the U.S. Civil Rights Trail, sites must be a place where Civil Rights history occurred and must be open to the public and currently welcoming tourists in groups to learn what happened there. • Clark Memorial United Methodist Church (1014 14th Avenue North, Nashville) which served as a meeting site for numerous civil rights efforts. In 1958, James Lawson hosted workshops on nonviolent protests at the church, and in 1961 Dr. Martin Luther King Jr. held the annual meeting of the Southern Christian Leadership Conference there. • Davidson County Courthouse and Witness Walls (1 Public Square, Nashville) where student leaders confronted Nashville’s mayor on the steps of the courthouse after months of lunch counter sit-ins and economic boycotts to protest segregation. Witness Walls is inspired by these events and people. original “five and dime” stores, F.W. Woolworth became the site of some of the first lunch counter sit-ins during the 1960s Civil Rights Movement in Nashville. This location was the site of a number of successful sit-ins that served as models for later demonstrations in the South. The new Woolworth on 5th restaurant honors the history of this space by serving as a welcome table for all. 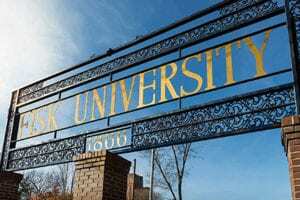 the first African-American institution to receive accreditation from the Southern Association of Colleges and Schools. Many of the university’s students were the backbone of sit-in demonstrations that successfully desegregated Nashville’s lunch counters. 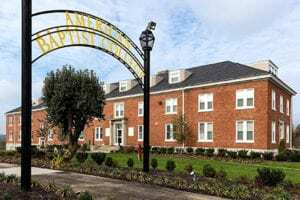 Since 1924, American Baptist College has carried out its mission of developing Christian leaders and preparing them to serve and work for social change and justice in the world. The college produced some influential civil rights leaders, including Julius Scruggs, Bernard LaFayette, Jim Bevel, William Barbee and John Lewis. Under the guidance of Professor J.F. Grimmett, the Rev. Kelly Miller Smith and the Rev. Dr. C.T. Vivian, these young men participated in the Nashville sit-in movement and set the tone for nonviolent protest in the South. • Civil Rights Room at the Nashville Public Library (615 Church Street, Nashville) which allows visitors to learn the story of the Nashville sit-in movement and view the same powerful photos that captured the nation’s attention years ago. Lee Sentell, Director of the Alabama Tourism Department who was instrumental in the U.S. Civil Rights Trail project, said the Nashville area was very prominent in the early discussions about Civil Rights particularly Fisk University along with American Baptist College where U.S. Representative and Civil Rights leader John Lewis attended school. Sentell said the accumulated result of all of the activity that happened throughout the South in the early 1960s encouraged minority leaders all over the world such as Nelson Mandela while he was imprisoned in South Africa, and other oppressed people in countries such as Poland and Germany, to continue their struggle to overcome discrimination. Many of those people want to come to the South to learn more about the origins of the movement. Sentell said his group will attend international marketplace trade shows later this year to learn if any international motor coach operators will begin tours of the Civil Rights Trail. Tom Morales, owner of Woolworth on 5th restaurant, said Nashville has three types of tourists…those who come for country music and the Broadway experience, those who come for bachelorette and celebration parties, and those who come to conventions. He believes there is a sizable section of the convention tourism crowd who aren’t interested in country music and instead are looking for other sites to tour in Nashville such as those on the Civil Rights Trail. Woolworth on 5th is the most prominent Nashville destination on the Trail. Since opening on February 5, 2018, Morales said, there has been a lot of interest from tourists and even celebrities such as Oprah Winfrey and “A Wrinkle in Time,” director Ava DuVernay have visited. “It has been eye opening the amount of people that come through for the history,” Morales said. Woolworth on 5th has been renovated to reprise the original Woolworth and now serves as a restaurant and live music venue. Through a massive restoration effort, much of the original architecture was preserved, including the upper level mezzanine, gilded handrails and wall accents, and hand-laid tile. 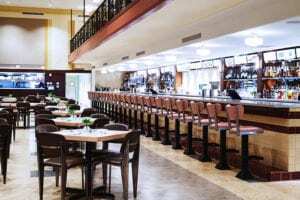 Parts of the 18,000-square-foot space that could not be preserved were recreated to echo the style of the past: flowing staircases, the rebuilt lunch counter, wood-paneled walls, turquoise colors and an art deco-inspired vibe. Morales said Woolworth on 5th is a destination restaurant that serves Southern inspired cuisine and pays homage to Nashville’s Civil Rights history.